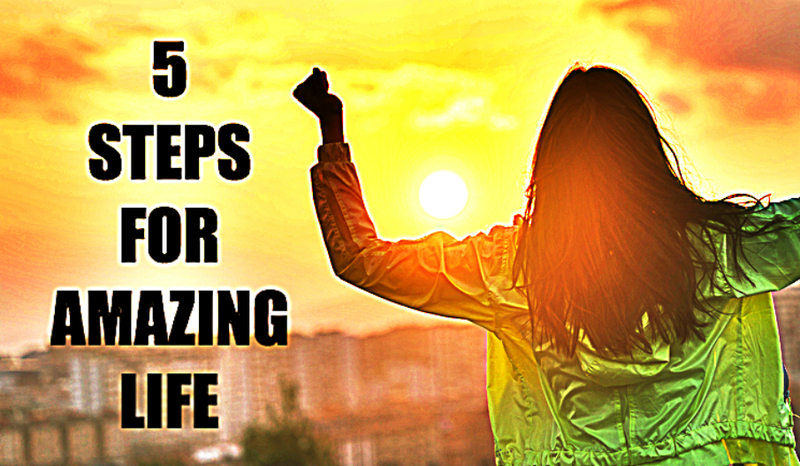 Here are five steps to an amazing life. At every step, your life will get noticeably better. Put together, you’ll be experiencing perfection. This is not something made up, but the cumulative wisdom of thousands of years of the yoga tradition, now confirmed by modern science. The first step is to look inside. Before you can make any changes to how you’re living and what your mind is doing, you have to become a witness to your own self. What are you thinking, what’s your focus, what are you feeling? Track your mind’s movements and get in touch with not only your emotions but what’s behind them. Keep track of your motivations and desires and see what their outcomes are. Take time to examine your consciousness. Silence is key for this. Focus not on external things or your endless to do list, but just on yourself. Get to know yourself deeply. Once you’re looking inside, now you can start taking control of what’s going on. This is when you take the helm and direct your life to where you want it. You assume FULL responsibility for your well being. No more victimhood. You put aside any idea that your happiness depends on anything or anyone else. You and you alone call the shots when it comes to how you’re feeling and the quality of your life. Now that you’re trying to command your mind, the first thing you need to do is to bring it to the here and now, which is a basic definition of mindfulness. Mindfulness is the portal for all higher states of consciousness. Being in the here and now is the solution to just about every form of suffering you impose on yourself. As your mind drifts to the past, you experience melancholy and lamentation. When your mind jumps to the future, in the false hopes of future happiness, you experience anxiety, fear, and frustration. True joy begins in the now. Being in the here and now allows you to bring your full attention to your task at hand. This raises a key question: what should I do? This is where the concept of dharma comes in. Dharma means your duty and essence. What’s the best you can do right now? What’s the purest expression of the best of you at this very moment? Dharma means prioritizing your true nature and learning to balance out your different demands and responsibilities properly. It’s about being guided by values, not external goals. It’s about living your purpose. Lastly, and most importantly, you need transcendence. You need love. Bhakti means transcendental love and devotion. Once you’re in the here and now, living the best of you, now you can make that your spiritual practice, by connecting it all in love of God. Love is the highest expression of the soul. You know this because you’ve experienced how love makes feel great. But love requires an object. You have to love someone. And you can only love someone to the extent they are “loveable”. That’s why, though we can all agree that love is the highest state of mind, we end up not experiencing it enough. Not many people are so loveable. Even if you don’t understand or accept the concept of God, at least you can see the logic here. God is defined as infinitely loveable. As such, you can love Him and Her infinitely, which naturally gives you access to an infinitely high state of consciousness and bliss. As an added bonus, God, being transcendent, is always with you, so you can experience this loving connection anywhere, at any time. So, there you have it: 5 steps to an amazing life. The first four will make your life flow with grace and enthusiasm. The last will take you beyond the constraints of material life, to an ocean of bliss. In the book, The 3T Path, you can see in detail all these points, the techniques necessary to make them happen and how this can transform your life. Watch the video on this topic!